Hillwood Art Museum consistently provides an environment that encourages exploration of the visual arts. The Museum supports the broader cultural and educational mission of its parent institution, Long Island University, for the good of the campus and broader Long Island community. Hillwood Art Museum is the caretaker of Long Island University's Permanent Art Collection. The University began acquiring work in earnest in the early 1970's and over the last three decades more than 650 new works have entered the collection through gifts and donations. 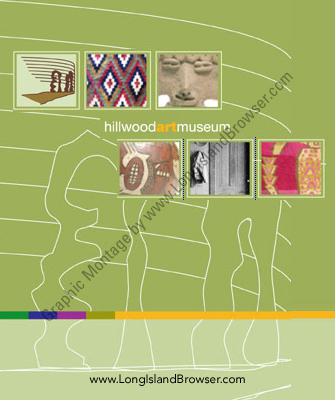 The Hillwood is please to have included in its Permanent Collection works of art from Africa. These wood, textile and ceramic works of art are a gift from Dr. and Mrs. Gilbert Graham, and join a collection that includes works from ancient China, Egypt and the Near East. The Hillwood is please to have included in its Permanent Collection work from the Han dynasty of China. These ceramic works of art are a gift from Dr. Alfredo Garcia, and join a collection that includes other works from the Ming as well as Han dynastys.